Hanoi (VNA) – The National Congress of the Vietnam-China Friendship Association (VCFA) for the sixth tenure (2017-2022) convened in Hanoi on August 3. Addressing the congress, Deputy Prime Minister and Foreign Minister Pham Binh Minh highlighted recent developments of the Vietnam-China relationship, including regular exchanges of meetings. The two sides have also reached agreements on enhancing mutual political trust, and improving cooperation and settling disputes to deepen ties between the two Parties and States in a stable manner, he added. The official also commented on close collaboration between Vietnamese and Chinese ministries, agencies, localities and people, as well as strides made in economic and trade cooperation, benefiting the two countries’ peoples. 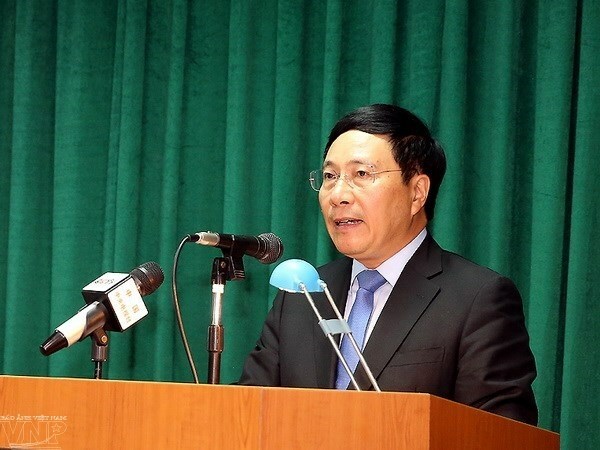 Stressing the contributions of the VCFA to the relationship during 2012-2017, Deputy PM Minh said the association has diversified its activities, serving as an important bridge between the two nations. To strengthen bilateral relations, he urged the association to step up their friendly exchanges, improve its organisation quality and promote friendship among people from all social strata, especially youths. The Deputy PM noted his belief that the association will attain more achievements in the 2017-2022 term, contributing to increasing mutual understanding, friendship and cooperation between Vietnamese and Chinese people. Nguyen Van Tho, VCFA Vice President for the fifth tenure, said with branches in 30 cities and provinces, the association carried out many activities such as meetings, delegation exchanges and seminars, along with cultural and humanitarian activities. Chinese Ambassador to Vietnam Hong Xiaoyong emphasised that preserving and promoting China-Vietnam friendship is a responsibility shared by both sides. The Chinese Embassy in Vietnam wishes to closely partner with the association to diversify people-to-people diplomacy. The congress elected a new 70-member executive board. Nguyen Xuan Thang, member of the Communist Party of Vietnam Central Committee, and Director of Ho Chi Minh National Academy of Politics, was re-elected as president.